43 To cure ye redness of ye face. take and boyle the rootes of Lillies in faire water and there with wash and rub the fact morning an evening. 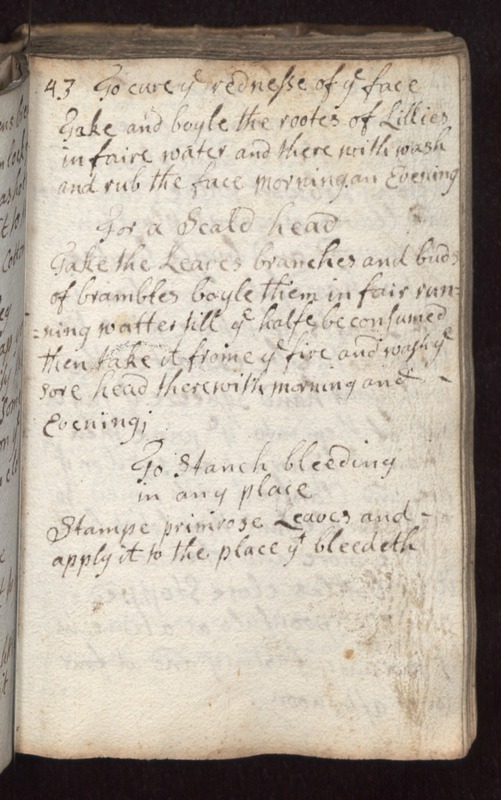 for a Scald Head Take the leaves branches and buds of brambles boyle them in faire running watter till ye halfe be consumed then take it frome ye fire and wash ye sore head therewith morning and evening, To Stanch bleeding in any place. Stampe primrose leaves and apply it to the place ye bleedeth.